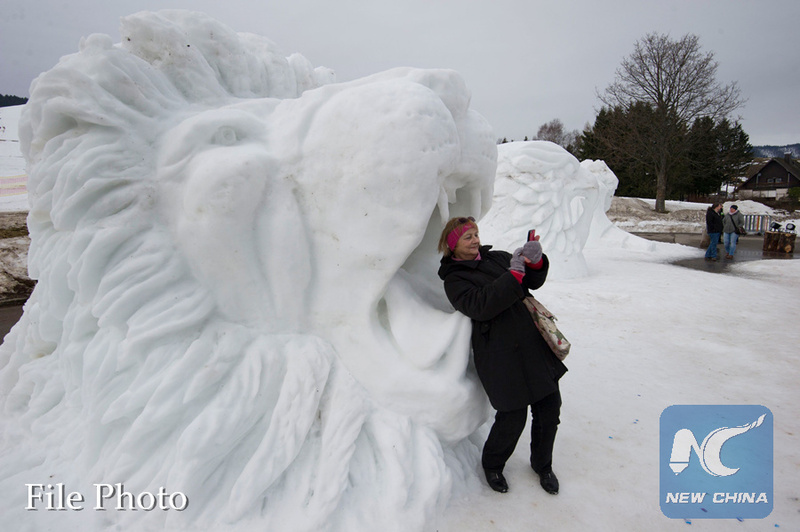 ULAN BATOR, Jan. 27 (Xinhua) -- Team Mongolia won gold at the 28th International Snow Sculpture Championships in Breckenridge, the U.S. state of Colorado on Saturday with a piece entitled "The Secret." Alongside 14 other teams, Mongolia worked a total of 65 hours across five days until Jan. 27 without the use of power tools, internal support structures or colorants. This is the sixth year of Mongolian artists participating in the competition. In 2017, Artists' Choice was split between the Mongolian teams. Also, the first place winner of both the Artist's and People's Choice Awards of the 23rd Breckenridge International Snow Sculpture Championships Awards was Team Mongolia, whose "Mongolian Warriors" sculpture depicted life-like 13th-century warriors and their horses striding out of a solid 20-ton block base of snow. This year's Silver was awarded to Team China for their homage to "The Thinker" piece. Team USA won Bronze with their piece titled "Dance Divine." Last year's winner of the Snow Sculpture Championships was Team China with a piece entitled, "Mermaid."